BOSTON, Massachusetts, October 25, 2012 (ENS) – Two dozen investors with more than $800 billion in assets under management are urging an immediate extension of the production tax credit for renewable energy, which expires December 31. The investors say this tax credit supports the U.S. wind industry by creating economic benefits for wind power producers and their suppliers. In a letter delivered to Congressional leaders on Wednesday, the investors ask Congress to extend the tax credit before it expires. First passed by President George H. W. Bush in 1992, the credit amounts to 2.2 cents for each kilowatt-hour of renewable power generated. According to the American Wind Energy Association, the production tax credit has led to $20 billion in private investment and the creation of 75,000 jobs. Several of these investors met with Congressional staffers today to discuss their support for the credit, which has been stalled by Republican opposition. 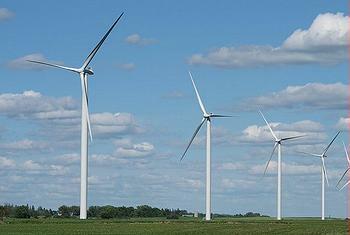 On September 20, the Senate failed to take up a bill to extend the wind production tax credit. Majority Leader Harry Reid of Nevada, a Democrat, asked the Senate to consider the tax credit extension, but Republicans objected, although earlier this year, the U.S. Senate Finance Committee approved it on a bipartisan vote of 19-5. Due to lack of certainty about expiration of the credit, wind industry employers have been laying off workers, but although Republicans say their election campaigns are based on job creation, they do not support extending the credit. “In the U.S. House, Republican leaders are also refusing to take up a wind production tax credit extension. This opposition has consequences. It costs jobs and devastates communities like Fort Madison,” said Harkin. Iowa’s other U.S. Senate seat is filled by Republican Chuck Grassley, who also called for renewal of the wind production tax credit, although he buried the call in language criticizing the Obama Administration. Matthew Patsky, CEO of Trillium Asset Management, one of the signers of the investors’ letter to Congress, also speaks of the need for certainty that an extension of the tax credit would bring. In the race for the White House, the contenders are clear about where they stand. President Barack Obama backs the tax credit extension, while Republican challenger Mitt Romney wants to see it expire. Touring a newly opened wind farm in Iowa in August, Obama warned ending the wind energy production tax credit would cost the country 37,000 jobs. But Romney “will allow the wind credit to expire, end the stimulus boondoggles, and create a level playing field on which all sources of energy can compete on their merits,” a Romney spokesman Iowa’s “Des Moines Register” newspaper in August. The signatories of the letter to Congress, many of whom are members of the Investor Network on Climate Risk, include state treasurers and several of the largest pension funds in the country including the California State Teachers Retirement System, the New York State and New York City Comptroller’s Offices, and the North Carolina, Pennsylvania and Oregon State Treasurers. “The production tax credit is vital to fostering a vibrant renewable power sector, which will improve our economic competitiveness while also reducing our reliance on fossil fuels,” said Oregon State Treasurer Ted Wheeler, who oversees the management of $72.5 billion of state funds. “Renewable energy generation opportunities beckon from border-to-border in Oregon, and they promise to produce not only clean and sustainable power but also crucial employment and investments in key infrastructure,” Wheeler said. Oregon wind farms now generate enough energy to power 700,000 homes, and the state hosts the North American headquarters of wind power companies Vestas and Iberdrola Renewables. “This credit pays for performance in the renewable power sector, and it deserves to be extended as soon as possible,” said Liu. Over the past five years, wind power has accounted for 35 percent of newly installed electricity generation capacity in the United States. Bolstered by the tax credit, production costs for wind power are down over 90 percent since 1980. But each time the production tax credit has been allowed to expire, annual wind capacity installations have fallen at least 73 percent in the following year. The investors say they are trying to encourage Congress to avoid such a disastrous outcome.